We already know Google has put Facebook and other social network websites into dark with its superb new social network website “Google+”, this service by Google gets a really heat among top personalities around the web, especially among the tech guys, hackers, and other bloggers. In the some last reports we heard that Google is about to launch new feature in its beta social network, “Google Business Pages” which is same to the Facebook Page. But I think there is something missing, some handy thing? yeah the username option like we have on Facebook (http://www.facebook.com/freakgeeks), missing of this feature is currently highlight by several blogs and users, but we also know the world of developers not limited to the company service, they can develop and do anything by their self. We have just hear from the guys over InTech-BB, that some one has developed the website which allow you to create username for your Google+, but its highly noted here that the service not give you official username. 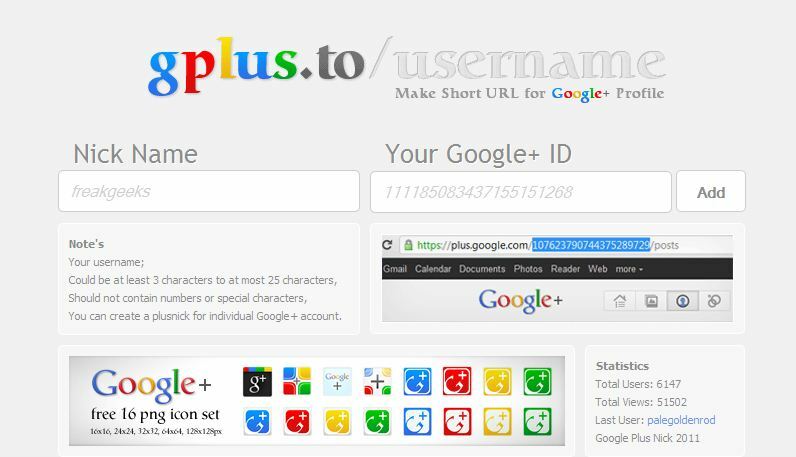 This website will give you username like this (http://gplus.to/username), so if you are still interested to get one for your profile or your business account, simply go to the website and open your Google+ profile in the other tab and copy the Profile ID from the link, for example: https://plus.google.com/111185083437155151268/posts (bold letters is your profile id), after copying the profile ID, heads back to the website tab, and now in this turn in the field of Username, write your desired username and in ID post the ID which you have copied and at last click on the “Add” button.